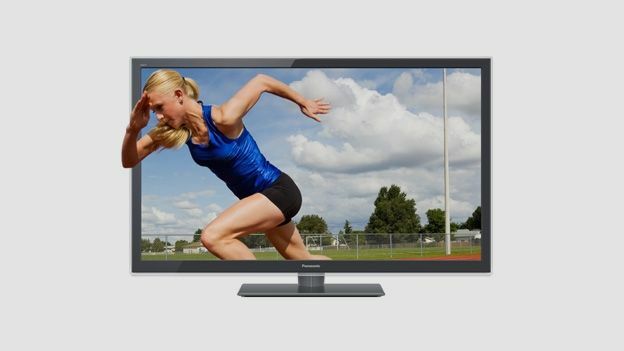 The Panasonic TX-L47ET5 is a well equipped net-connected Passive 3D Full HD LED TV that won't break the bank. What's not to love? Very much providing the template for the brand's incoming 2013 LED TVs, the Panasonic TX-L47ET5 combines net connectivity with comfortable 3D and polished usability. This 47-inch model squares off against the Sony KDL-46HX753 and the LG 47LM660, and forms part of a comprehensive range that starts with the TX-L32ET5 and reaches up to the 60-inch TX-L60ET5. Does it have what it takes to make it into our list of the best TVs around? 3D compatibility and internet connectivity are the key attractions here. Panasonic's Smart VIERA portal includes BBC iPlayer, Netflix, Acetrax, Fetch TV, Dailymotion and YouTube amongst others, alongside the ubiquitous social media clients, while an SD card reader provides convenient playback of digital images and movies. Local USB playback support is wide, including MKV, although network playback is less comprehensive. Style-wise, this screen is decidedly designer-neutral. The glossy grey bezel is edged with translucent beading, which adds a stylish flourish , but overall the TV doesn't try too hard to draw attention to itself. Connectivity is fine, with caveats. The set has four HDMIs, three USBs, Ethernet, an optical digital audio output, PC input, plus Scart and component (via adaptors). Having all side-facing HDMI inputs transpires to be a bit of a pain, as it's difficult to prevent chunkier HDMI cables from poking visibly out to the side; you'll need to stick with thin, flexible ultra-cheap interconnects. Wi-Fi is built-in. Picture quality is punchy and sharp. Blacks have been crushed to improve dynamics, but colour fidelity is outstanding. With good HD source material, be it from the set's Freeview HD tuner or a connected Blu-ray player, images sparkle. The edge-LED backlit reveals characteristic light-pooling at the sides but in general use isn't intrusive. If this 120Hz panel does have an Achilles' heel it's motion resolution, which is limited to around 850 lines, even with Intelligent Frame Creation (IFC) on Max. The set's Passive 3D performance works well enough. Four pairs of glasses are included. It's important to view the TV square on; go vertically off-axis and the 3D picture breaks-up. The TV can also depth-convert 2D sources, but this trick is little more than a novelty turn. Audio quality is perfectly serviceable, thanks to a plucky pair of stereo speakers. Panasonic's ET LED TVs are worth phoning home for if you're after a no-nonsense affordable telly with cutting-edge niceties. There's a good selection of streaming internet services available from the brand's Smart portal and image quality benefits from some high-end picture processing DNA, although the limitations of the panel itself ultimately dictates overall performance levels. We also rather like the set's Passive 3D. Overall, we rate the TX-L47ET5 as a well-equipped mainstream flatpanel that just about punches above its weight.